In a previous blog post, I discussed the lecture presented by fraktur specialist Lisa Minardi at the Park Avenue Armory in New York at the Winter Antiques Show. I was eager to visit the three venues where various fraktur collections will be on display in 2015. I attended the conference “Fraktur and the Everyday Lives of Germans in Pennsylvania and the Atlantic World, 1683-1850” organized by the McNeil Center for Early American Studies at the University of Pennsylvania. It was a fraktur filled weekend and exceeded my expectations. 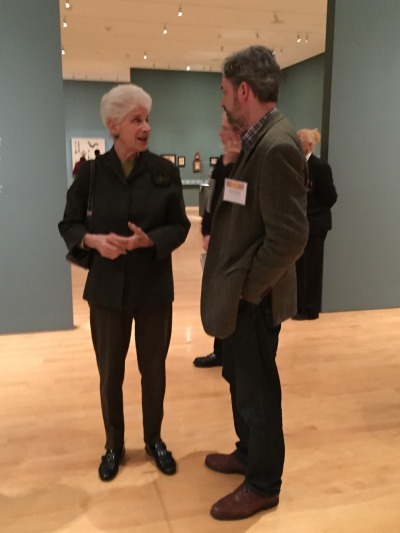 The first day of the conference included a gallery tour of the fraktur collection presented to the Philadelphia Museum of Art by Joan & Victor Johnson. Imagine the attendees’ delight when Joan Johnson herself joined our tour group and graciously provided insights on her beloved fraktur. It was an absolute treat to experience her generosity. And now for the fraktur! a Burlington County New Jersey example! Joan Johnson joined us on the tour! The accompanying book to the exhibit by Lisa Minardi is beautifully illustrated and contains a wonderful interview with Joan & Victor. The exhibition runs through April 26, 2015 and is located at the Perleman Building of the Philadelphia Museum of Art, 2525 Pennsylvania Avenue in Philadelphia.